There are so many health benefits of a diet that is rich in Omega-3 fatty acid. Aside from taking an Omega-3 fat supplement, how can you incorporate more of this essential nutrient in your diet? There are plenty of delicious foods that are naturally high in Omega-3 fats. Some of them you may know already, others may surprise you! 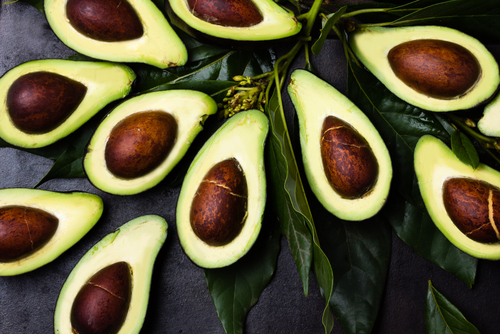 Below, find some of my favourite foods that contain high amounts of Omega-3 fats – along with the best ways to prepare them to preserve it – and other nutrients you’ll enjoy from eating these foods. Now that you know about the benefits of Omega-3 fats, it’s time to figure out how to get more of it! Because Omega-3 fatty acids are not naturally produced by your body, you must acquire them through diet or supplements. 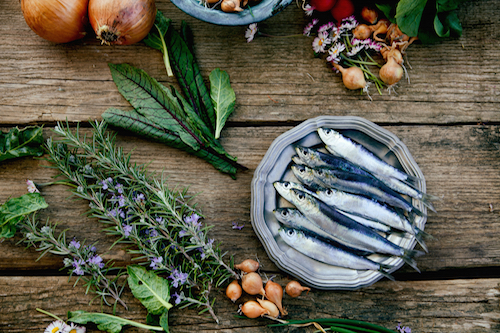 Luckily, you have plenty of options when it comes to choosing Omega-3-rich foods. Keep in mind that most plant-based sources of Omega-3 fats contain alpha-linolenic acid (ALA), not EPA and DHA. ALA is still beneficial—think of it as building blocks your body uses to create EPA and DHA. Unfortunately, it’s not a very efficient process; only about 5% of diet-sourced ALA is converted by the human body. Note: All of the nutritional information including here, including serving sizes, is from the USDA’s National Nutrient Database for Standard Reference and based on a 2,000 calorie per day diet. Fish and seafood are the best sources of whole food dietary Omega-3 fatty acid you can find. Without a doubt one of the most popular sources of whole food Omega-3 fats, salmon contains 633 mg per ounce. This Omega-3 fat is mainly in EPA and DHA, meaning your body can use it as soon as it enters your bloodstream. Salmon is an excellent source of lean protein and contains approximately 10% of your daily recommended intake (RDI) of both niacin and Vitamin B6 and 13% of your daily Vitamin B12 needs. Look for sustainably-caught wild salmon, and eat it baked or grilled. Although you tend to think of canned food as being less healthy, canned sardines are a great way to get fish-sourced Omega-3 fats when you’re on-the-go or need to pack a lunch. 1oz of canned sardines contains 414 mg of Omega-3 fat and is high in Vitamin D and Vitamin B12. Plus, it delivers over 10% of your calcium RDI! Sustainably-farmed shellfish are healthy and delicious as appetizers or a main course. 3oz of cooked oyster contains approximately 427 mg of Omega-3 fats, plus over 3 times your RDI of Vitamin B12 and over 2.5 times your RDI of zinc. The same serving of mussels delivers 736 mg of essential Omega-3 fat and lots of critical vitamins and minerals. Choosing grass-fed beef can be a healthier alternative to traditionally-farmed (i.e. grain-fed) beef. Grass-fed beef contains about 5.9 mg of Omega-3 fat per ounce, and some beef producers have managed to raise the amount of naturally present Omega-3 fat in their beef by feeding marine algae to livestock.36 The amount of Omega-3 fat in the beef you buy will vary based on how the beef was raised. Eggs and dairy products are not always high in Omega-3 fat, though some brands offer egg and dairy products with added Omega-3 fatty acid. 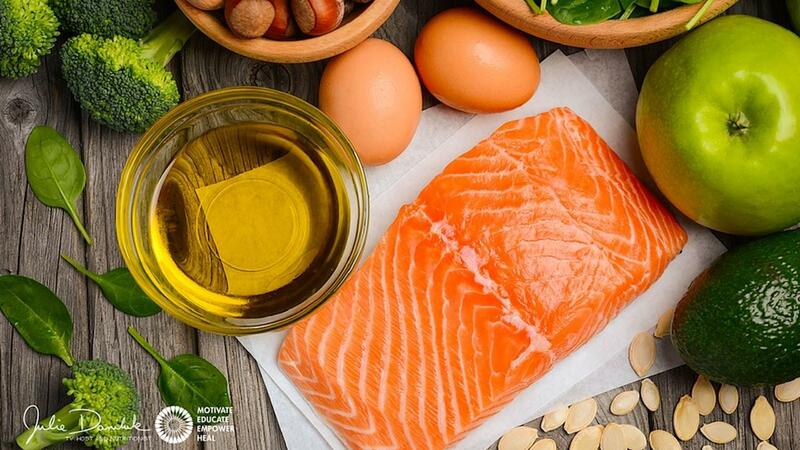 The quality and bio-availability of this additional Omega-3 fat varies between producers, so it can’t be guaranteed – I encourage you to do your own research before purchasing products with added Omega-3 fatty acid. Usually, the added Omega-3 fat comes from fortifying the animals' diet with marine algae or another source of Omega-3 fat. One large egg contains approximately 71 mg of Omega-3 fat. Some producers of eggs fortified with Omega-3 fats (i.e. eggs produced by hens fed a diet rich in Omega-3 fats) claim their products contain up to five times that amount. Although you may choose organic eggs or eggs produced by free-range hens over conventional eggs for other reasons, there isn’t a substantial difference in the Omega-3 fat content of those eggs. 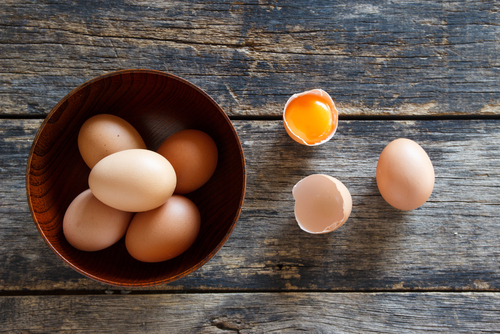 Overall, eggs are a great source of many vitamins and minerals – including riboflavin, Vitamin A, Vitamin B12, Vitamin D, Vitamin E and Vitamin K – and a good source of protein. There are so many different kinds of milk available that it’s impossible to tell you exactly what each serving contains. Most kinds of milk are fortified with various vitamins and minerals. Some producers now offer milk and dairy products fortified with Omega-3 fat, which, like beef fortified with Omega-3 fat, are a result of feeding dairy livestock diets higher in Omega-3 fats. The Omega-3 fat content of any of these products cannot be guaranteed... though I'm happy that so many people are realizing the potential health benefits of increasing their intake of Omega-3 fats! Nuts and seeds are a great source of Omega-3 fats and are very popular for including more whole food sources of Omega-3 fat in vegan and vegetarian diets. While the numbers may seem high (hello, walnuts! 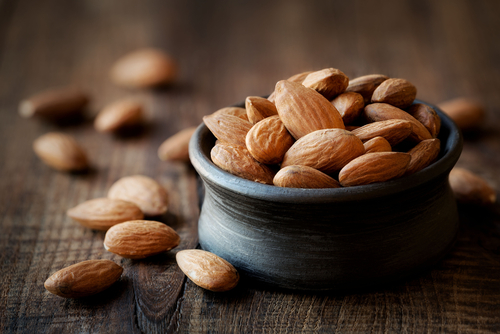 ), remember what you learned earlier about the differences between the Omega-3 fatty acids: nut and seed sources of Omega-3 fats are primarily ALA, which must be converted to EPA and DHA in your body. They also tend to be higher in Omega-6 fats, which can cancel some of the health benefits of increasing your Omega-3 fat intake. Hemp Hearts are nutty and sweet, like pine nuts. They offer 830 mg of Omega-3 fatty acids per tablespoon. Flaxseed and Chia seed provide the benefits of high Omega-3 fat, though when they get wet their mucilage fibre gets slippery and sticky. Hemp Hearts' crunchy, yet creamy, texture makes it a versatile vegan Omega-3 fat source. One ounce of walnuts contains a whopping 2500 mg of Omega-3 fats! I know what you’re thinking—why not just eat walnuts every day to meet your Omega-3 fat dietary need? While walnuts are an excellent food to incorporate into your diet (the same serving contains nearly half of your RDI of manganese, 8% of your Vitamin B6 intake and 4.3g of protein), keep in mind that the Omega-3 essential fatty acids found in walnuts are ALA, which still must be converted to EPA and DHA in your body. Since your body only converts ALA at a rate of about 5%, you won’t receive the same benefits as you would by ingesting an equivalent amount of EPA and DHA. Macadamia nuts contain about 58 mg of Omega-3 fats in a 1oz serving and, of all the tree nuts, have one of the most balanced ratios of Omega-3 fatty acid to Omega-6 fatty acid. They’re also high in thiamine, a water-soluble B vitamin, which helps convert carbohydrates into usable energy. Flaxseed is an excellent source of Omega-3 fats, as far as plants go. One ounce of flaxseed contains 6388 mg of Omega-3 essential fatty acids, and only 1655 mg of Omega-6 fatty acid, which is a good balance. If you eat whole flaxseeds, you won’t receive as many nutritional benefits, so try to eat ground flaxseed instead. Keep in mind that ground flaxseed doesn’t have a long shelf life – if you can grind your own flaxseed at home, it's better! Try sprinkling it over yogurt or adding it to smoothies. Chia seeds have been gaining popularity in recent years, and for good reason – they’re tiny nutritional powerhouses! One ounce of chia seeds contains 4915 mg of Omega-3 fats and 1620 mg of Omega-6 fast. While chia seeds don’t contain much in the way of vitamins, they deliver several crucial dietary trace minerals including calcium, phosphorus and manganese. Like flaxseed, you can sprinkle chia seed over yogurt, add it to smoothies or make your own chia seed pudding. Soybeans are most often prepared and eaten as edamame. While different methods of preparation can alter the nutritional content of the soybean, raw soybeans contain approximately 963 mg of Omega-3 fast. They’re extremely high in calcium and iron – 1 cup of raw soybeans contains approximately half your RDI of each! They’re a great source of dietary fibre, folate, Vitamin C, potassium and more. To be honest, fruits and vegetables aren’t a great source of Omega-3 fats. While they’re definitely an extremely important part of a healthy, nutritious diet, they do not contain significant amounts of Omega-3 essential fatty acids. That said, some are better than others – and can be paired with Omega-3-fat-rich foods for maximum nutritional value! Technically a fruit (though more versatile due to its mild taste), avocados are nutritional superheroes for a variety of reasons. A medium-sized avocado contains approximately 165 mg of Omega-3 fat. It also delivers nearly a quarter of your daily recommended potassium, 30% of your daily folate and 40% of your RDI of fibre. Eat avocados sliced with salt and pepper, or mash them up with freshly-squeezed lemon juice and your preferred spices for guacamole! Just keep in mind that they also contain high levels of Omega-6 fats, so be sure to balance them out with other foods high in Omega-3 fats. While they’re certainly not a huge source of dietary fats, leafy greens still punch above their weight when it comes to Omega-3 fat content. Eaten raw (like in a salad), 1 cup of kale has 121 mg of Omega-3 fat, and 1 cup of spinach has 41 mg. They also provide lots of healthy dietary fibre, a tonne of vitamins and minerals such as calcium and iron. One cup of cauliflower contains approximately 31 mg of Omega-3 essential fatty acids. It contains 77% of your RDI of Vitamin C and 20% of your Vitamin K RDI. Steam your cauliflower for the most nutritious results. Brussels sprouts are a very divisive food! If you’re a Brussels sprouts lover, you’ll be happy to learn that 1 cup of cooked Brussels sprouts contains 270 mg of Omega-3 fat. It provides more than twice your RDI of Vitamin K, 24% of your daily folate requirements and lots of Vitamin C.
Of course, the easiest way to ensure you’re getting enough Omega-3 fat in your diet is to take an Omega-3 fatty acid supplement. Ensure the Omega-3 fat product you choose is of the highest quality and potency, so you know you’re getting the EPA and DHA benefits your body needs. NutraSea liquid Omega-3 contains 1250 mg EPA and DHA per teaspoon and comes in delicious flavours like Zesty Lemon and Chocolate. If you prefer fish oil in a capsule format, NutraSea also comes in Liquid Gel formats containing between 1000 and 1250 mg of Omega-3 fat. Try adding liquid NutraSea to your favourite smoothie recipe to make it nutritious and extra-tasty! If you prefer a higher ratio of EPA in your Omega-3 fat supplement (for athletes or addressing chronic inflammation issues), NutraSea HP contains 1500 mg EPA and 500mg DHA in every teaspoon. 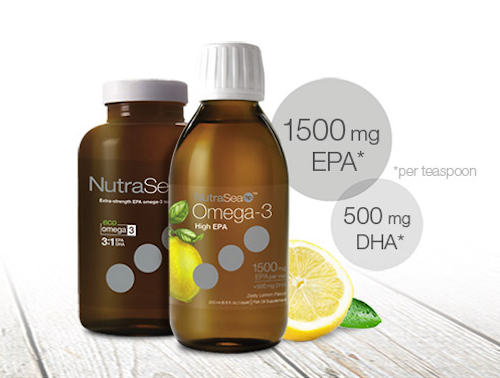 NutraSea HP is available in both lemon and grapefruit-tangerine flavoured Omega-3 fat liquid and in a Liquid Gel format. Try adding NutraSea HP to your favourite guacamole recipe for an added EPA boost! For a higher ratio of DHA, choose NutraSea DHA—it contains 1000 mg DHA and 500 mg EPA in every teaspoon. NutraSea DHA is available in a juicy citrus flavour liquid format, and in 2x concentrated Softgels. Like the rest of the liquid Omega-3 fat products, it’s a delicious addition to your favourite smoothie recipe, or great on its own! For a vegan, vegetarian or non-fish source, the new and improved NutraVege formula delivers 500 mg EPA and DHA per teaspoon, sourced from marine algae and free of animal products. NutraVege 2x has 1000 mg of EPA and DHA per teaspoon—the most potent vegan Omega-3 fat product ever. As a bonus, they come in mouthwatering flavours: Strawberry Orange and Cranberry Orange. You’ll be in vegan smoothie heaven, and never worried about Omega-3 fatty acid deficiency in your diet! With so many Omega-3 fat supplement options, the recipe opportunities are nearly endless. Try adding them to dishes already high in Omega-3 fats, like adding a teaspoon of NutraSea to your favourite homemade salad dressing and serving it up with baked salmon. NutraSea liquid Omega-3 products are also amazing in smoothies, mixed in with yogurt or pudding, or straight from the spoon! *with permission from Nature's Way Canada. Hibbeln, J.R., Fish consumption and major depression. Lancet, 1998. 351(9110): p. 1213. Pottala, J.V., et al., Red blood cell fatty acids are associated with depression in a case-control study of adolescents. Prostaglandins Leukot Essent Fatty Acids, 2012. 86(4-5): p. 161-5. Lin, P.Y., S.Y. Huang, and K.P. Su, A meta-analytic review of polyunsaturated fatty acid compositions in patients with depression. Biol Psychiatry, 2010. 68(2): p. 140-7. Mozaffari-Khosravi, H., et al., Eicosapentaenoic acid versus docosahexaenoic acid in mild-to-moderate depression: a randomized, double-blind, placebo-controlled trial. Eur Neuropsychopharmacol, 2013. 23(7): p. 636-44. Gertsik, L., et al., Omega-3 fatty acid augmentation of citalopram treatment for patients with major depressive disorder. J Clin Psychopharmacol, 2012. 32(1): p. 61-4. Sinn, N., et al., Effects of n-3 fatty acids, EPA v. DHA, on depressive symptoms, quality of life, memory and executive function in older adults with mild cognitive impairment: a 6-month randomised controlled trial. Br J Nutr, 2012. 107(11): p. 1682-93. Dacks, P.A., D.W. Shineman, and H.M. Fillit, Current evidence for the clinical use of long-chain polyunsaturated n-3 fatty acids to prevent age-related cognitive decline and Alzheimer’s disease. J Nutr Health Aging, 2013. 17(3): p. 240-51. Huang, T.L., Omega-3 fatty acids, cognitive decline, and Alzheimer’s disease: a critical review and evaluation of the literature. J Alzheimers Dis, 2010. 21(3): p. 673-90. Cunnane, S.C., et al., Fish, docosahexaenoic acid and Alzheimer’s disease.Prog Lipid Res, 2009. 48(5): p. 239-56. Stonehouse, W., et al., DHA supplementation improved both memory and reaction time in healthy young adults: a randomized controlled trial. Am J Clin Nutr, 2013. 97(5): p. 1134-43. Titova, O.E., et al., Dietary intake of eicosapentaenoic and docosahexaenoic acids is linked to gray matter volume and cognitive function in elderly. Age (Dordr), 2013. 35(4): p. 1495-505. Fontani, G., et al., Cognitive and physiological effects of Omega-3 polyunsaturated fatty acid supplementation in healthy subjects. Eur J Clin Invest, 2005. 35(11): p. 691-9. Gao, Q., et al., Omega-3 polyunsaturated fatty acid supplements and cognitive decline: Singapore Longitudinal Aging Studies. J Nutr Health Aging, 2011. 15(1): p. 32-5. Yurko-Mauro, K., et al., Beneficial effects of docosahexaenoic acid on cognition in age-related cognitive decline. Alzheimers Dement, 2010. 6(6): p. 456-64. Freund-Levi, Y., et al., Omega-3 fatty acid treatment in 174 patients with mild to moderate Alzheimer disease: OmegAD study: a randomized double-blind trial.Arch Neurol, 2006. 63(10): p. 1402-8. Wen, Y.T., J.H. Dai, and Q. Gao, Effects of Omega-3 fatty acid on major cardiovascular events and mortality in patients with coronary heart disease: a meta-analysis of randomized controlled trials. Nutr Metab Cardiovasc Dis, 2014.24(5): p. 470-5. Kotwal, S., et al., Omega 3 Fatty acids and cardiovascular outcomes: systematic review and meta-analysis. Circ Cardiovasc Qual Outcomes, 2012. 5(6): p. 808-18. Rizos, E.C., et al., Association between Omega-3 fatty acid supplementation and risk of major cardiovascular disease events: a systematic review and meta-analysis. JAMA, 2012. 308(10): p. 1024-33. Kwak, S.M., et al., Efficacy of Omega-3 fatty acid supplements (eicosapentaenoic acid and docosahexaenoic acid) in the secondary prevention of cardiovascular disease: a meta-analysis of randomized, double-blind, placebo-controlled trials. Arch Intern Med, 2012. 172(9): p. 686-94. Chen, Q., et al., Effects of Omega-3 fatty acid for sudden cardiac death prevention in patients with cardiovascular disease: a contemporary meta-analysis of randomized, controlled trials. Cardiovasc Drugs Ther, 2011. 25(3): p. 259-65. Marik, P.E. and J. Varon, Omega-3 dietary supplements and the risk of cardiovascular events: a systematic review. Clin Cardiol, 2009. 32(7): p. 365-72. Leon, H., et al., Effect of fish oil on arrhythmias and mortality: systematic review. BMJ, 2008. 337: p. a2931. Yates, C.M., P.C. Calder, and G. Ed Rainger, Pharmacology and therapeutics of Omega-3 polyunsaturated fatty acids in chronic inflammatory disease. Pharmacol Ther, 2014. 141(3): p. 272-82. Lorente-Cebrian, S., et al., An update on the role of Omega-3 fatty acids on inflammatory and degenerative diseases. J Physiol Biochem, 2015. Balk, E.M., et al., Effects of Omega-3 fatty acids on serum markers of cardiovascular disease risk: a systematic review. Atherosclerosis, 2006. 189(1): p. 19-30. Bernstein, A.M., et al., A meta-analysis shows that docosahexaenoic acid from algal oil reduces serum triglycerides and increases HDL-cholesterol and LDL-cholesterol in persons without coronary heart disease. J Nutr, 2012. 142(1): p. 99-104. Wei, M.Y. and T.A. Jacobson, Effects of eicosapentaenoic acid versus docosahexaenoic acid on serum lipids: a systematic review and meta-analysis.Curr Atheroscler Rep, 2011. 13(6): p. 474-83. Miller, P.E., M. Van Elswyk, and D.D. Alexander, Long-Chain Omega-3 Fatty Acids Eicosapentaenoic Acid and Docosahexaenoic Acid and Blood Pressure: A Meta-Analysis of Randomized Controlled Trials. Am J Hypertens, 2014.